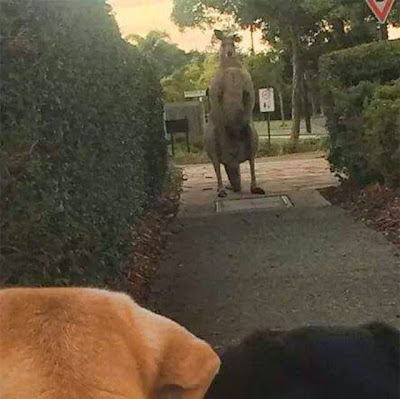 Residents in North Lakes, Brisbane, Australia, are being kept on the hop by a massive kangaroo. Smaller kangaroos are often seen in the area but the big buck stands out from the troop due to a distinctive tear in his left ear. Local Linda Hellyer said he is arguably North Lakes most imposing resident. “He's very intimidating he's a big boy. He is more than two metres tall and weighs up to 95 kilograms. “He's the last thing you would expect to run into while walking in the suburbs.” But Ms Hellyer came close. “We turned the corner and old mate jumped out he's very big and I don't want to take him on. A local farmworker, Pedro Firpo, traveling alone that night when he was suddenly surprised to see a strange creature which jumped out of a small arroyo on the side of the road, the rolled onto the middle of the roadway and began ‘dragging’ itself at an “impossible speed” across the road in front of the startled witness. It then disappeared “like a magic act”. Firpo could not describe the creature as either human or animal, but it seemed to be a mixture of human and ape. It also a short tail, a black face as if blackened by ash and very hairy. It seemed to be crouching down and it also seemed to be wearing a loose fitting garment or “sack”. It appeared to be “dirty or stained” according to Firpo, who arrived home later that night with his blood pressure skyrocketing. The witness was surprised at the incredible speed it dragged itself across the road, “like a movie being played at high speed”. Later several others returned to the site where the creature had been seen and were surprised to see at least 15 dogs mysteriously congregated on the side of the road. Locals describe Firpo as a hardworking family man and never known to invent such incredible tales. The city of Richmond’s department of animal control could not confirm the presence of “a large cat-type creature” reportedly spotted near the Reedy Creek entrance of James River Park on Thursday. According to a city spokesman, an officer was sent out but nothing was found. Animal control did investigate some tracks in the sand, but determined those to be canine. There is a long history in Virginia of people seeing large house cats and other animals and believing them to be cougars, also known as mountain lions or panthers. The last wild cougar confirmed in Virginia was killed in Washington County in 1882. “There is still not a single shred of evidence or documentation to suggest there are any wild cougars or mountain lions in the state of Virginia,” said Mike Fies, a state Department of Game and Inland Fisheries biologist. Capt. Kevin Kilgore, supervisor of the city’s law enforcement division of animal control, could not comment on the specifics of Thursday’s report, but a resident shared a similar sighting on the Forest Hill Neighborhood Facebook page Thursday morning. That sighting involved “a darkly colored panther or very large cat” that “ran up a tree and gave ... a low growl” when confronted. “The likelihood of a wild cat that size would be extremely remote in this area,” said Kilgore, unless someone kept a large, wild cat as a pet that got loose. Nearby Maymont has one large cat in its care, a bobcat, and that cat is accounted for, according to representatives at the park. Kilgore said a hybrid cat — a domesticated cat that’s been bred with a wild cat — could be a possibility. Those cats can grow to be as large as a dog and do not need to be specially licensed in the city of Richmond. It is not rare for black bears, otters, beavers and many other animals to roam the park, he said. Fies said where cougars do live “they don’t exist like ghosts in the wilderness.” They get hit by cars and photographed by modern trail cameras, of which there are plenty today, he said. A picture taken of a print in James River Park near the possible big-cat sighting clearly shows claws. On a beautiful sunny morning, two men who lived at the Valdez Marine Terminal construction camp had decided that after breakfast they would take a cruise up the highway. They were impressed that the day seemed very quiet and sleepy. There were few people up and about as they had breakfast. They left without any well-defined destination in mind so the driver just turned right at the “Totem” Restaurant and Motel. The Totem was located at the edge of this little Alaskan community and his right-hand turn points you at a tight left-hand turn in the highway only a few hundred feet away. As they began the swing into this left-hand-turn in the highway they both had their attention stolen by what abruptly entered into their field of view just off the highway to their right approximately 150 – 175 feet away. It was so bizarre that the driver made a conscious decision to concentrate on a couple of specific items so that he might recall those items later on. They saw an oval-shaped ‘craft’ approximately 30-35 meters in diameter, it was the exact color and translucence of new bubblegum after chewing it for only a couple of minutes and then blowing a bubble. It was 6.5 m - 8.0 meters in height. Around the outside perimeter was a feature that looked a lot like a lab house (3/4 “). He estimated the diameter of this “hose” to be three quarters on an inch, and individual lights revolved inside the house every 4-5 seconds, in a counter-clockwise flow. The light looked as though it expanded the “hose” as it traveled from left to right around the craft. He recalls being particularly impressed by the ability for the hose which, at the same time seemed so much a part and parcel of the craft, seemed to effortlessly expand and then contract as the light coursed its way around. When he saw enough of the foregoing he began to catch glimpses before he drove out of view around said corner, leaving his friend to continue his observation before it went out of his view also. He saw a ramp dropped from the belly of the craft, approximately 4 – 5 feet wide and 6 – 7 feet long, he believes he observed two metallic extensions which comprised at least a part of the “landing gear”. Last, but certainly not least, he saw two small gray-green creatures, that looked like the stereo-typical description of “aliens”. At the distance of 50 or 60 yards he could not see any specific details. They were 4-5 feet tall, and seemed to be in a ‘quandary’ (the witness got a very distinct feeling that they were caught with their pants down and were in much of a hurry). Then they were out of his line of sight. He saw his friend turning to look out his window as he continued around the corner and, perhaps ten seconds later, sitting on the edge of the seat he turned staring vacantly out the windshield. He asked his friend, “Did you see what I just saw?” He did not answer and simply continued to look straight out the front windshield. For the third time he began to ask him that same question when he abruptly turned to him and nearly shouted, “You’re*****right I did”, and immediately got that far away look in his eyes again. The main witness then asked if they should turn around and go back, his friend immediately and with emphasis replied “NO!” The witness drove as far as the “Salmon Turnaround” (2 tenths of a mile away from the corner they had made their observations) and turned around there and went back. It was nowhere to be seen and his friend was against going out toward the beach area where they had seen it. He searched the skies for it or a contrail or anything that would tip off its location. He looked at the beach for skid marks, and the immediate mud-flat and water for a wake or concentric circles of it going underneath the water, nothing. He estimates that from the moment they saw the craft until they returned to the site and found it gone was less than four minutes. Later his friend became increasingly unwilling to discuss the event after a few months and refuses to acknowledge the entire experience these days.